ill-conceived USA Patriot Act that was rushed through Congress in the wake of the September 11 terrorist attacks. In 2002, while the Bush administration's fabrications and scare tactics persuaded an overwhelming majority of the Senate to vote for the Iraq war resolution, Feingold opposed it. Washington insiders thought such controversial votes could doom Feingold's 2004 reelection. But he won by a near landslide, far outdistancing his party's presidential candidate, John Kerry. 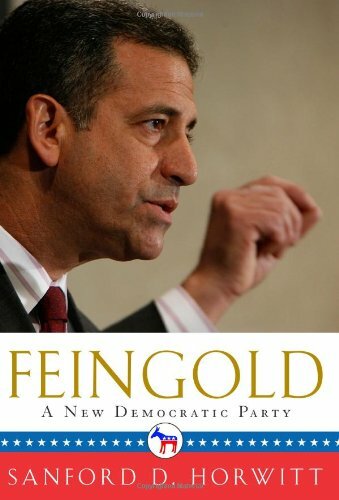 Sanford D. Horwitt writes in this timely, compelling independent biography that Russ Feingold "represents the progressive side of the Democratic divide more clearly and authentically than any successful politician on the national stage." The third-term senator's willingness to take bold stands -- he was the first in the Senate to call for a timetable for redeploying U.S. troops from Iraq -- has inspired a growing number of rank-and-file Democrats across the country. Drawing on scores of interviews and historical documents, Horwitt shows that Feingold's authenticity is deeply rooted in the old progressive tradition personified by one of his heroes, Robert M. La Follette, the legendary Wisconsin governor and U.S. senator. "Fighting Bob" and the other great reformers of the Progressive Era placed a high value on honest, efficient government, investment in public education, health and infrastructure, and curbs on corporate power and other wealthy interests in the political process. Feingold became known to a national audience when he teamed up with Republican John McCain on campaign finance reform legislation. After a seven-year battle, the McCain-Feingold bill became the first major reform of the campaign laws since the Watergate era. Feingold, who grew up in a small southeastern Wisconsin town, is a man of modest means and the grandson of Jewish immigrants. In this lively portrait, Horwitt evokes mid-century Janesville, a Republican stronghold on the banks of the Rock River, where a precocious Rusty Feingold absorbed lifelong lessons about the importance of community and personal integrity. Beginning with his first election to public office, he has defied conventional political wisdom and long odds, Horwitt tells us, a pattern that has been repeated throughout his career. Feingold has shown how a new, reinvigorated Democratic Party can stand for progressive ideals, resist the corrupting influence of special interests and win elections.